Wednesday February 3- 1932 A nice day Hattie to the monthly meeting at The Church. Letter from Winnie. I wrote Laura. Ott here for short call. I read to Hattie in evening some pain Mrs [Barber] & SS class each sent beautiful plant Thursday February 4- 1932 It snowed last night. I did not feel very well in AM Letter from Ida & Le Grand. I wrote Winnie & Ida in PM. Hattie rode to Oxford with Rob in PM Ott here. William & Mary in evening. Read in evening Friday February 5- 1932. Felt better today. Wrote to Ott Seibert I did some of the work. Mary took Hattie up home in PM for some things she wanted. Mrs. Ball and Dr Lemon called while she was away Ott here awhile William & Mary in evening. Some pain today. Read aloud to Hattie. Saturday February 6- 1932 I talked to Dr Ned in forenoon and he sent me medicine. I read some. Ida Anderson here to call Ott came for Hattie. He has company for supper Rob here a moment. Letter from Mrs [Greenholh] at Rosslyn Mrs Gay up in the evening. 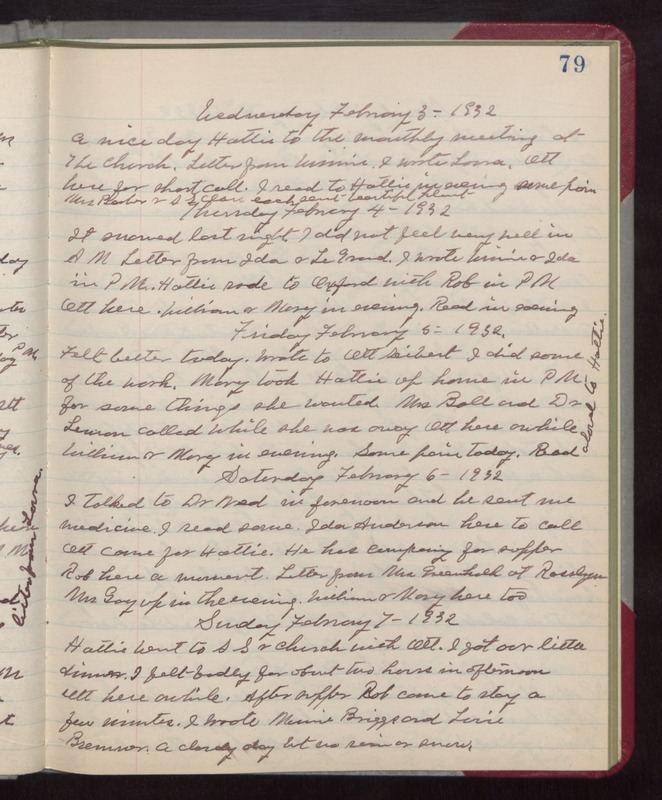 William & Mary here too Sunday February 7- 1932 Hattie went to S S & church with Ott. I got our little dinner. I felt badly for about two hours in afternoon Ott here awhile. After supper Rob came to stay a few minutes. I wrote [Marnie] Briggs and Louie Bremner. A cloudy day but no rain or snow.